The St. Louis Cardinals were once known for highlight reel heroics in their outfield. These days were rarely seen in 2016 but from 2000-2007, the Cardinals had a beast patrolling center field. I enjoy penning love letters to players who continue to impress me even beyond their years on the field. If you haven’t read my love letters to Aaron Miles, then jump over here and read them. And why wouldn’t you; Aaron himself reads them. 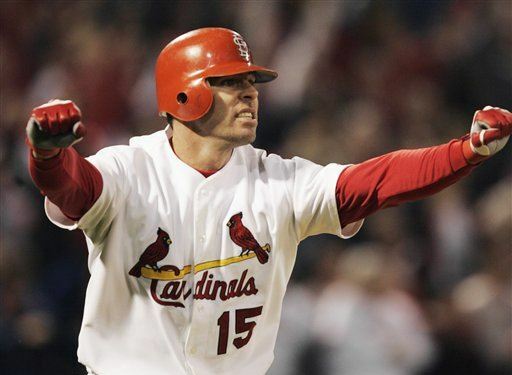 Today’s love letter is written to the great St. Louis Cardinals center fielder, Jim Edmonds. In the wake of the news that the St. Louis Cardinals would love a new center fielder, I found myself wishing that a second-coming of Edmonds could occur. Can we clone this amazing All-Star and force the clone to play only for the St. Louis Cardinals? If we could bring in this clone, we would be adding a career (in St. Louis) .285/.393/.555 left-handed bat in St. Louis. We would be adding a career (in St. Louis) center field UZR of 4.55. Would or should we desire this or am I clouded by my love affair memory glasses? The current St. Louis Cardinals center fielder, Randal Grichuk, holds a career (in St. Louis) .254/.302/.495 from the right side of the plate. These numbers come from three years of service, while Edmonds’ numbers shown above are from seven years of service to St. Louis. Defensively, Grichuk holds a career (in St. Louis) center field UZR of 3.2 over three years. Bottom line for me is that I would take Edmonds and his outstanding outfield prowess over Grichuk any day. I would take Edmonds’ highlight reel dives and over-the-shoulder catches. I would take Edmonds’ bat-drop after that beautiful home run swing. Speaking of home runs, Grichuk has amassed forty-four with St. Louis while Edmonds earned 241 in his eight years with St. Louis. If we equalized Edmonds’ home runs across his eight years, he earned an average of 30.1 home runs per year (reminder: Grichuk has 44 in three years). Home runs are nice and clearly Edmonds is a better home run hitter than Grichuk but was he a better hitter? I ask this question because I was always taught that a team of base hitters could out-score a team of home run hitters. Edmonds collected 1,033 hits in his eight years (average of 129.1 per year). In his three years, Grichuk has collected 223 hits (average of 74.3 per year). So, I clearly loved Jim Edmonds. I would 100 percent take Edmonds back in center field if I could have the 2000s Edmonds. I mention this to say that I doubt that Edmonds could cover the ground today at the age of 46. The dude is built, though, and I bet he could still slam a few dingers. I just have doubts that he could rebound quickly enough between games to play a full season. 11/28 – St. Louis Cardinals: Should Carlos Beltran Return to the Redbirds? No offense, Edmonds, but the booth is probably your best bet. And speaking of the booth, I was very concerned during Jimmy’s first year on the broadcast team. He was stiff. He was awkward. Thankfully, though, those days are now behind him and he seems comfortable and at home in the broadcast booth. I wish the broadcast team would allow him additional opportunities to be on the air. Okay, so it goes without speaking that I loved Jim Edmonds. That said, is there a center fielder out there today who would emulate the talent and abilities of Jim Edmonds? A.J. Pollock owns a .293/.346/.461 with 421 hits and 39 home runs in five years but even those impressive number pale in comparison to Edmonds. Dexter Fowler owns a career (nine years) .268/.366/.422 with 1001 hits and 78 home runs. Those numbers are the closest out there but would come with a hefty price tag for sure. Want your voice heard? Join the Redbird Rants team! All-in-all, it would be ideal to clone Edmonds but while that is just not possible yet, then perhaps a pick up of Fowler would make the most sense if using Edmonds as the litmus test for center fielders. Will the St. Louis Cardinals go in this direction? Time will tell.